Who wouldn't love to receive this wonderful card. Yes it is a card. I know, it looks like a box full of orchids. Well it is, but it is also card. Would you believe that it folds flat to post in a normal envelope. There is even a place to write a greeting on the back. I have used the gorgeous Climbing Orchid stamp set and matching framelits in this box. I have an Uncle who adores orchids and has grown them for as long as I can remember. Even though this card is very girly and I don't think a 80 odd male would appreciate it, this is a nod to him. Actually I should make him a card using this set, but make it less girly, as he hasn't been well. It would cheer him up I am sure. I have used three of the 2017-2019 InColors in this box. Fresh Fig, Berry Burst and Lemon Lime Twist. I think this latest batch of InColors are truly beautiful, and they work together very well. 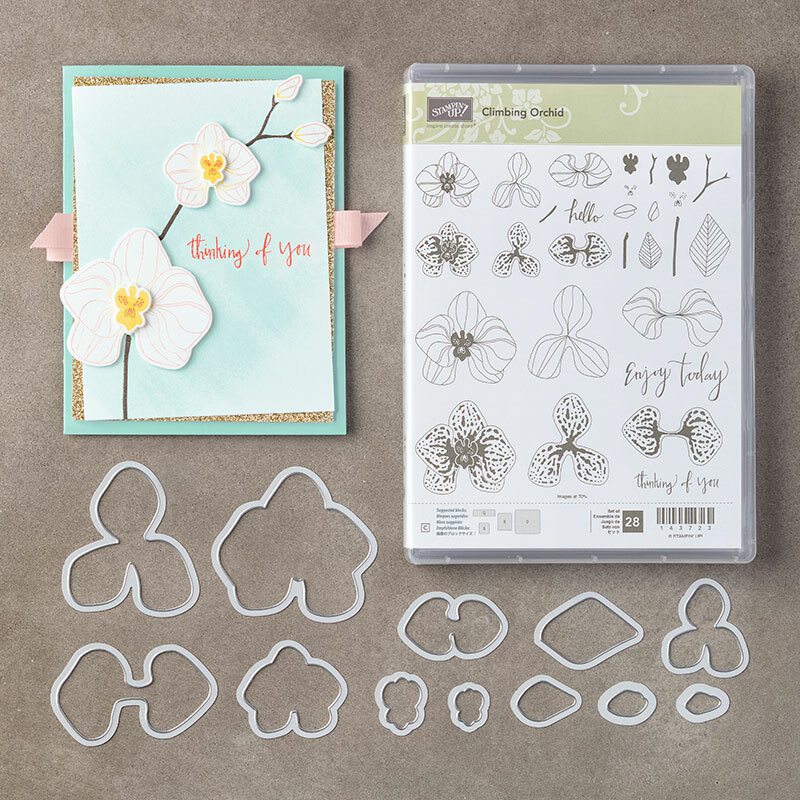 Here is the Climbing Orchid stamp set in case you haven't seen it yet. The stamp set comes in a bundle with the matching framelits. 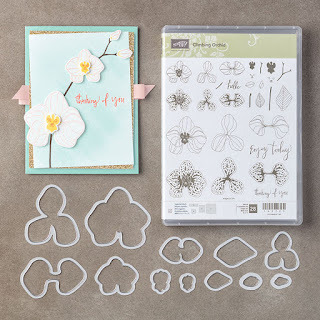 It makes creating your stunning flowers so easy and the bundle is 10% cheaper than buying the stamps and framelits seperately. Get your bundle at 10% off here. 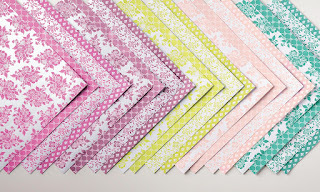 I have teemed this bundle with the Fresh Florals patterned paper. You have probably seen me use this paper quite a bit. That is because it is excellent value for money. You get 40 sheets of double sided paper for only $38.50. What great value. This is what it looks like if you haven't seen it yet. This box full of orchids was one of the projects in the July Stamping By Mail. 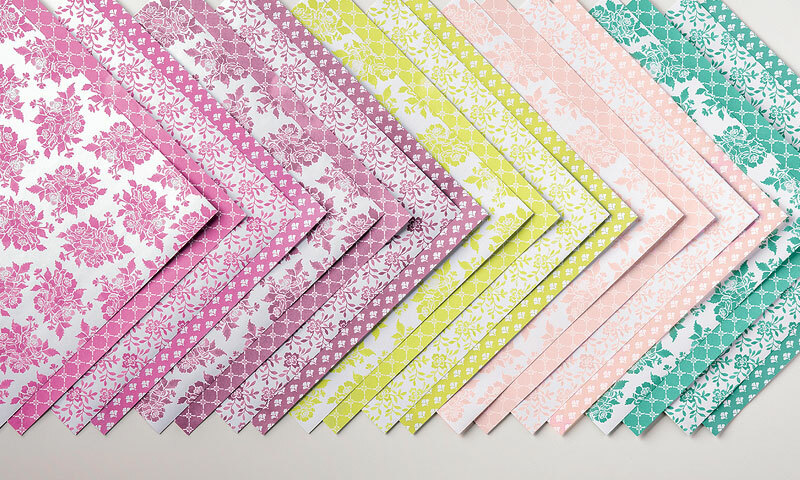 Stamping By Mail is a class delivered to your door. For all stampers from the beginner to the experienced. To see what the current class is using, click on the graphic below.